Earlier in the day, the EU has vehemently condemned a poisoning attack on ex-Russian intelligence officer Sergei Skripal in Salisbury, stressing that the bloc takes the UK assessment of Moscow's possible involvement in it "extremely seriously." The Russian Foreign Ministry stated that the EU's statement on Skripal poisoning suffers from speculation and lacks concrete evidence in assesments. Russia's foreign ministry went on stressing that there is nothing to disclose as the chemical substance used for Skripal's poisoning is not manufactured or stored in Russia and advised the EU ministers to visit the UK lab in Porton Down. Moscow's response comes in the wake of Brussels' statement, in which the European foreign ministers expressed the EU's "unqualified solidarity with the UK and its support, including for the UK’s efforts to bring those responsible for this crime to justice." "The European Union strongly condemns the attack that took place against Sergei and Yulia Skripal in Salisbury, UK on 4 March 2018, that also left a police officer seriously ill. The lives of many citizens were threatened by this reckless and illegal act. The European Union takes extremely seriously the UK Government's assessment that it is highly likely that the Russian Federation is responsible," the statement of the EU foreign ministers reads. Brussels went on to urge Moscow to disclose information on the alleged Russian state program on the production of Novichok, a military-grade nerve agent, to the Organisation for the Prohibition of Chemical Weapons (OPCW). "The European Union is shocked at the offensive use of any military-grade nerve agent, of a type developed by Russia, for the first time on European soil in over 70 years. The use of chemical weapons by anyone under any circumstances is completely unacceptable and constitutes a security threat to us all. Any such use is a clear violation of the Chemical Weapons Convention, a breach of international law and undermines the rules-based international order. The EU welcomes the commitment of the UK to work closely with the Organisation for the Prohibition of Chemical Weapons (OPCW) in supporting the investigation into the attack. The Union calls on Russia to address urgently the questions raised by the UK and the international community and to provide immediate, full and complete disclosure of its Novichok programme to the OPCW," according to the statement. Earlier in the day, EU foreign policy chief Federica Mogherini expressed the bloc's full solidarity with the UK on the issue, calling the Salisbury incident "unacceptable." French President Emmanuel Macron urged Russian President Vladimir Putin in phone talks on Monday to shed light on the circumstances surrounding the poisoning of former Russian intelligence officer Sergei Skripal, the Elysee Palace said in a statement. Meanwhile, Swedish Minister for Foreign Affairs Margot Wallstrom said on Monday that she expected the EU foreign ministers to agree on new measures against Russia in connection with the poisoning of former Russian spy Sergei Skripal in the United Kingdom. "First of all, we want to express our solidarity with the United Kingdom… This is an important discussion on the follow-up, we, of course, know that it has not been easy always to get the unity to back up the sanctions that we already have decided on. But I think that the discussion today will give a good ground for further actions. And it is very very important that we are united that we demonstrate the solidarity with the United Kingdom today," Wallstrom said as she arrived for a Foreign Affairs Council meeting in Brussels. The minister went on saying that she expected her UK counterpart Boris Johnson to provide comprehensive information on the Skripal case to the participants of the Foreign Affairs Council's meeting. On Friday, German Chancellor Angela Merkel expressed hope that Russia would take part in the investigation of the poisoning of former Russian intelligence officer in the UK. However, the chancellor mentioned the alleged traces in the attack, pointing, as she claimed, to the Russian responsibility for it. 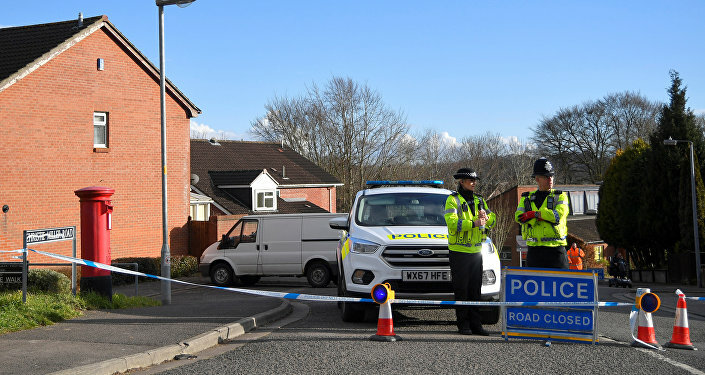 Skripal and his daughter were poisoned in Salisbury on March 4. UK Prime Minister Theresa May blamed the incident on Moscow, claiming that the substance allegedly used in the attack was developed in Russia. Russian officials have denied all accusations made by the United Kingdom. Moscow has expressed its readiness to collaborate on the investigation into this case and requested access to the samples of the nerve agent allegedly used in the poisoning incident, but London has denied this request. Russia and the United Kingdom have each already implemented a series of response measures since the incident.